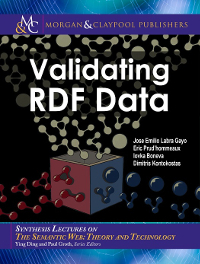 This book started as an RDF validation tutorial that we prepared for the International Semantic Web Conference (ISWC) 2016. The slides are still available at http://weso.github.io/RDFValidation_ESWC16/. After the tutorial, the editors invited us to extend the slides to write a full book on the subject. We want to thank Harold Solbrig for his collaboration with the tutorial and his support and participation in the development of ShEx. Although the task of extending the tutorial seemed easy at first, writing a book on this subject was much more daunting than expected. One challenge was to update the material to the changes that ShEx and SHACL were experimenting with during the W3C process. There were different points of view on how to tackle the RDF validation problem that led to the appearance of two camps, which at the time of this writing are represented in two W3C groups: the Shape Expressions community group and the SHACL community group. We would like to acknowledge the people participating in those groups as well as the people that were part of the W3C Data Shapes Working group. During the development of the book we were also updating our implementations. We also want to thank all the people that have been using our implementations and online demos for their patience when something was not working as expected and for submitting issues or suggesting improvements to the tools. We want to thank Amy van der Hiel for the design of the cover art, as well as Dan Brickley and Tom Baker for their comments and suggestions. We are also grateful to Vladimir Alexiev for his extensive review and proofreading of the book. Jose Emilio Labra Gayo wants to thank his colleagues from Oviedo3 and the WESO research group. Special thanks to Edita for her support and patience. He dedicates the book to Sergio, Nuria, and Alex. Dimitris wants to thank Sebastian Hellmann, his AKSW and KILT colleagues and the University of Leipzig for their continuous support. His contribution to this book would have not been possible without the initial funding from the H2020 program for project ALIGNED (GA 644055). He dedicates this book to his family. Eric wants to dedicate this book to his family, who put up with him writing when he should be playing. He also has great gratitude to Gregg Kellogg, who always takes time to hack with him, and Tom Baker, who always takes time to write with him.